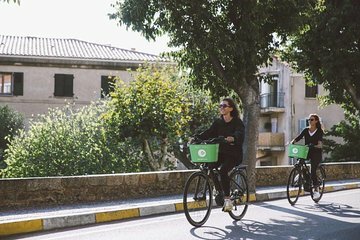 Discover the top attractions in Ajaccio with a self-guided e-bike tour. Follow an itinerary to see the house where Napoleon Bonaparte was born, the narrow streets of the old town, and the Cathedral where Napoleon was baptized. Explore the market at Foch Square including crafts and food products made in Corsica. We were so looking forward to this experience and especially riding along the coast to the Sanguinaires islands, which we booked and paid for in advance as advised online, to avoid lines and get quickly on our way. However we were hugely disappointed with the lack of organisation, problems and mis-description of the experience which made it impossible to reach the islands in the time available for which the bikes were hired. The first problem was that we were not met at the clearly specified meeting point (the tourist office) in town, a short walk from the cruise terminal. No one was there and no information was available or signed. When we called the number given on the booking, we were told it was not possible to use the tourist office as the rendezvous point, due to construction works in the area, and that we had to come to the actual bike hire shop instead. No taxis were available and this was at least a 20 minute walk along a busy road in the opposite direction from the tour route. And when we finally got there, we were also told there was no option of returning the bikes anywhere but back at the hire shop, not the tourist office. The bikes themselves were great to ride, but we had to go back into town to pick up the route, and encountered a lot of difficulty in the traffic-choked streets and although the coastal scenery was lovely, the promised idyllic cycle paths along it were non-existent. We had to ride either on the busy roads or on the partly available paths and pavements shared with many pedestrians. We had to give up long before completing the route to the islands in order to be back at the hire shop on time (2 hours' hire). With the roads and paths the way we found them, it is hard to imagine how anyone could complete the self-guided tour in 2 or 2.5 hours, unless they went at maximum speed down the main roads without stopping at any of the points of interest! Which, as first time visitors and on e:bikes, was not our plan. The people in the bike shop did at least kindly drive us back to near the original meeting point, so that we didn't have to do the long walk back again.